Many professional video editing software such as Premiere Pro and Final Cut Pro, haven’t feature the ability to sync video and audio files in batch. Gone are the times when one had to manually sync the audio or resort to different plugin with the DaVinci Resolve software. This can be done in the Media Pool with a few easy steps. In this article, we will introduce how to sync audio and video in different situations, such as the video footage and audio file has the same timecode metadata, and video footage shot with a DSLR having onboard sound. No matter if you are using the timecode or the waveform method, you can easily auto sync your footage or manual sync with the help of the DaVinci Resolve. If you are looking for an easier way to sync audio and video, we recommend you to try Wondershare Filmora Video Editor. Apart from audio syncing, you can also edit your audio, like adding fade in and fade out effects, remove background noise and detach video and audio files. Typically, there are 3 ways of synchronizing the video and audio in DaVinci Resolve. You can sync audio and video automatically by both timecode and waveform, and manual syncing as well. Before syncing, you need to import the video and audio to DaVinci Resolve first. To start a new project in DaVinci Resolve, you need to go to Project Settings and turn off the ‘Use local version for new clips in timeline’ from the Color page. Create a new bin and import the video and files to sync. To enable the auto-sync feature, you need to import the video and audio file in the same bin. Now the added video and audio files will be available on the Media Pool and get them organized. Now you need to right click the bin and select ‘Auto Sync Audio based on Timecode’ (in which case the in-cam audio tracks will be replaced with the external audio) or ‘Auto Sync Audio Based on Timecode and append tracks’(in this case the in-cam audio is preserved while the external audio tracks are added). Open the video in the Viewer and the exact frame which the slate hits needs to be traced. The frame timecode should be noted. Now open the audio file and stop it on the exact frame where the clap of the slate is heard. Right click on the audio file in the Media Pool and then you need to select ‘Clip Attributes’ and enter the video timecode on the timecode pane. Now repeat the last step, right click the video and audio files and then select ‘Auto Sync audio based on timecode’ once again. 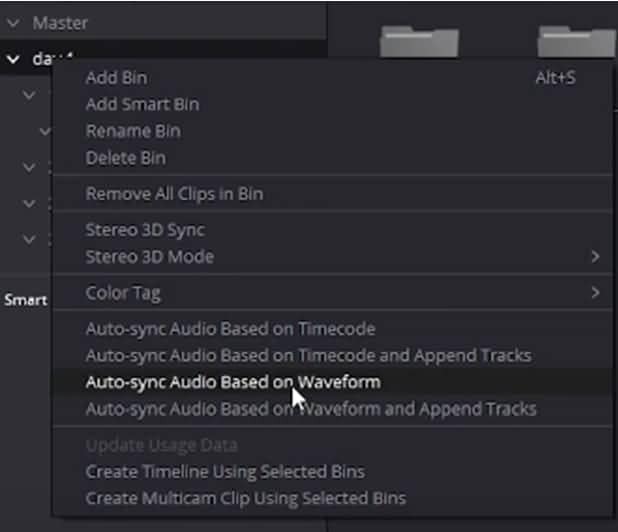 Now right click the bin containing the selected videos and audios and then choose ‘Auto-sync Audio based on Waveform’ or ‘Auto-sync audio based on waveform and append tracks’. Both the audio and video clip will be analyzed by DaVinci Resolve and matched according to its algorithms just like any other NLE with similar functions. It needs to be noted here that this method might not work seamlessly on every clip. There is an easy way of checking if the clips are synced or not- just toggle the List mode in DaVinci Resolve and find out the numbers of audio channels present in the video files. You might have to go back and choose the separate clips and audio files and get them synced once again. In case it doesn’t work you need to sync them manually. DRV 12.5 comes with an innovative way of navigating clips by making use of audio waveforms. The source viewer comes with a new audio waveform overlay that lets the editor watch the audio waveform and video clip simultaneously. This is surely the quickest way to navigate to any part of the clip. Create the project and a bin and import the video and audio files separately. Now you need to open the audio panel and then scroll downwards till you can find the starting point of the sound. On the top of the Waveform, the spike in audio representing the starting sound has to be checked. You need to look for the two set in points – 1 for video and 1 for audio and finally click the link icon. Your video will now be synced. Above are the steps of how to auto-sync and manual-sync video and audio in DaVinci Resolve, hope it helps you doing the syncing job. One more tip: syncing in small batches will be a good option in case that the syncing isn’t perfect. Is there a way to auto sync and append external recorder tracks to the video file with on board sound?